They are based on a Danish sweet treat, havregrynskugler, which essentially means ‘oat balls’. I first tried these at one of my favourite hyggelig cafes in Aarhus, a delightful little place attached to a deli and farm shop. For that reason, I assumed the oaty things they had out on the counter would be some kind of worthy, uber-healthy raw cake or similar, and finding myself in need of a snack with my cup of tea one day, I decided to try one. I was surprised by how utterly delicious it was, with the nutty, slightly sweet taste of oats that took me straight back to making flapjacks and oat biscuits as a child. I remember once trying to eat raw oats out of the jar, assuming that they were what made the flapjacks taste so good, so by that logic they should be delicious on their own. I was wrong. I am not a horse. My oats need to be doused in butter and sugar. And, obviously, as soon as I looked up a recipe for havregrynskugler online, I discovered that the secret of my snack's tastiness was, of course, butter and sugar. No healthy raw 'energy ball' style rubbish here, just pure decadence that you can pretend is marginally good for you because oats. They are normally a mixture of soft butter, sugar, chocolate and rolled oats. They have the delicious, toasty oaty flavour of the British flapjack, but with added truffley goodness from the cocoa and butter. Here, I’ve given them a fabulous Christmas twist by adding Bluebird’s Christmas Cake tea to the mix. This beautiful blend has all your favourite festive ingredients: vanilla, almond, cinnamon, cloves, orange peel, even spruce needles. Blitzing it to a fine powder adds all those wonderful flavours to the oaty snowballs, giving a warming hint of sweetness and spice. It’s the perfect aromatic background against the cocoa, cranberries and coconut. 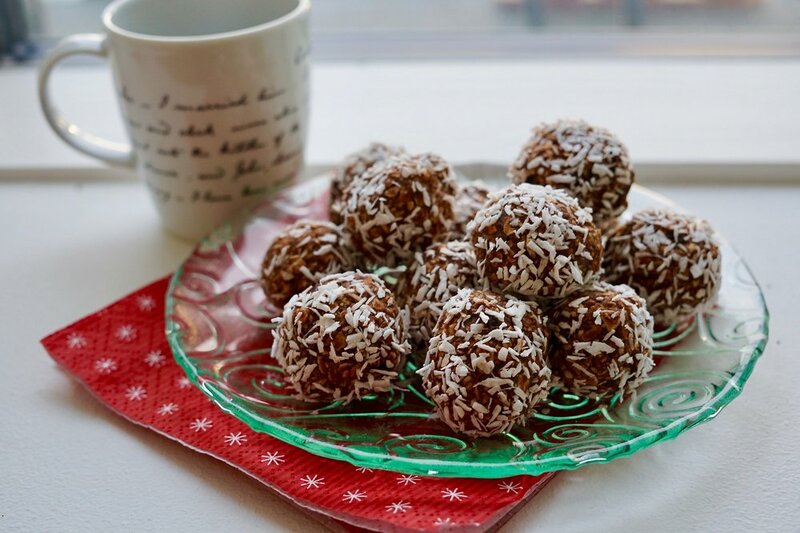 These delightful little balls of joy are the ultimate festive treat: they are the essence of Christmas, with their snowy coconut coating and sweet chocolate and cranberry flavour, and they take five minutes to make – perfect for emergency guests, Christmas parties or a lovely homemade gift. You could play around with the ingredients as you wish, too – try adding different dried fruits and nuts. You could also use coconut oil to make these vegan, and experiment with different teas in the mix too. There is no cooking required for these, and they come together in minutes, needing just a little time in the fridge before they’re ready to eat. The main thing is to keep it simple and watch your friends, colleagues and loved ones devour these little bundles of joy and come back for more. Pairing them with a tea-themed advent calendar is entirely optional, but very much encouraged. Put the tea in a spice/coffee grinder and grind to a fine powder. You can also do this using a pestle and mortar, although the result will not be quite as fine. Put all the ingredients, except the coconut but including the powdered tea, into a large bowl and mix well to combine. It helps to use a wooden spoon at first, and then your hands to squeeze the mixture together. Once it is well combined, roll into balls (about the size of a walnut) and roll in the desiccated coconut. Put on a tray and place in the fridge for at least two hours before eating.